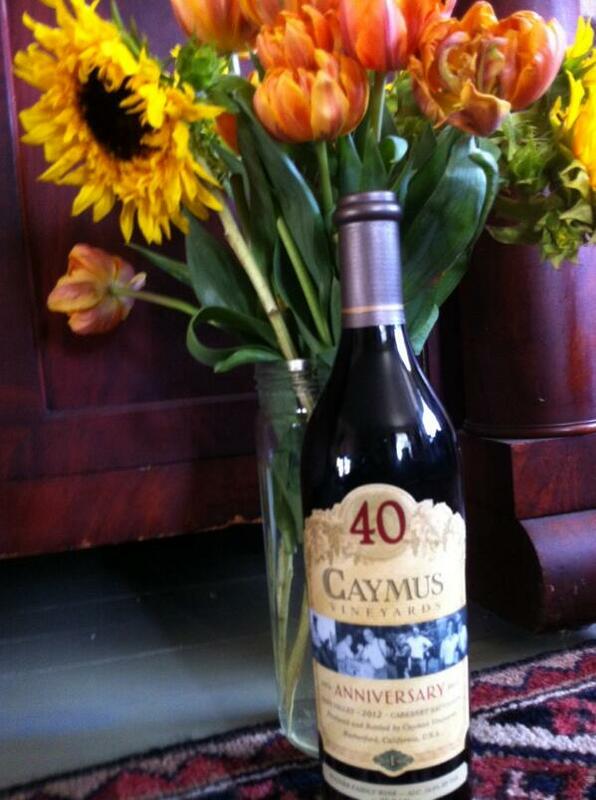 To celebrate their 40th vintage, Caymus Vineyards has released a 40th Anniversary special edition of their 2012 Napa Valley Cabernet Sauvignon, and they are organizing a HUGE anniversary party which they hope will be the largest virtual Twitter tasting ever, with wine writers, bloggers, collectors, enthusiasts and consumers across the country to participating. People are saying that the 2012 vintage will be exceptional–no frosts, mild spring, warm dry summer free of heat spikes which results in a classic rich black cherry plum and tobacco Napa Cabernet that I am excited to open in a few minutes and taste in 90! YOU ARE INVITED to JOIN US! If you live in the Ventura area, you can find this special bottling at the Ventura Wine Company for $55. And if you’re wondering whether you should hold until the bottle or drink it now? Well I bet this baby will be even better with a few years on it–just as long as you store it properly in a cool dark place. Note: This wine was provided to me as a sample for my review and participation consideration.